A restricted maiden auction stakes over 5f. Five colts take part, two raced. Experience counts for a lot at this time of the season. El Duque & Far Gaze both showed promise when making their debutes at Lingfield & Wolverhampton, respectively. The former is trained by Bill Turner who has the talented Mick's Yer Man, winner of two stakes races. El Duque, a son of Byron, was quite fancied on debut when ridden by Ryan While. This yearling cost 3,500gns when purchased by the trainer. He didn't have much luck on his racecourse bow when checked in the early stages, which meant he was always on the back foot. I think his jockey resigned himself to a considerate introduction but this bay ran on with some spirit in the closing stages giving the impression he could have finished closer if all had gone to plan. As it happens, the form of that race has been franked with the fifth and sixth winning next start and the seventh running a sterling race at kempton. Considering El Duque was in front of those horses he must be respected in what is most likely an ordinary race. On form Far Gaze looks to have a stiff task beating the above mentioned. This American bred colt, sired by Belmont, was pretty much thrashed by Stan Moore's Outback Lover who succumb to El Duque on her initial start. By all accounts Far Gaze needs to improve a good number of length to put down any challenge. However, two-year-old horses often improve considerably for their first start and I get the feeling this bay colt will show up well today. He is a fair-looking juvenile for this grade. A tardy start cost him any chance at Wolverhampton. It is interesting to note that this youngster has been entered to run in two stakes race, which indicates the stable have plans. A Brocklesby entry went amiss after the ground turned for the worse at Doncaster. The Brocklesby has been a fair pointer to the stable's better early juveniles in previous seasons and most ran creditably on their second start. The majority improved quite markedly. The debutantes wouldn't need to be anything special to win although they will most certainly need to be primed. It is never easy for juveniles to win on their first start. Red House is probably best watched. Alan McCabe is a trainer to respect with his juveniles and Red Warrior cost 8,000gns. The owners, Premspace, have had winning horses with Ed McMahon. Money is often the key pointer for this stable. In general, they feature a poor strike rate with their debutantes although when fancied they can go close. In such a small field it is difficult to assess the market as bookmakers will be unwilling to push the prices too far unless they consider a horse has next to no hope. I would take a watching brief unless seriously backed. Tyrsal is trained by Robert Eddery who certainly knows how to train a horse. They have had a few horse well backed on debut and they are a canny outfit. If backed this son of Jeremy is worth noting. Conclusion: Small fields don't enthrall me as value races. On form El Duque looks every inch a winner and could take this in some style. He is a fair-looking colt and the apprentice allowance is a plus. He showed spirit at Lingfield and should run all the way to the line. The horse to beat. I'm quite interested in Far Gaze simply because Moore has entered him for two stakes race, including the Brocklesby which I'm convinced is a pointer. He is a fair looker with a bit of strength and I expect a marked improvement. If prices allow, I would be tempted to have an each way bet. Whether he has enough ability to win only time will tell but it would put me off betting on the favourite. It may be a mistake to consider El Duque has no opposition. The debutantes are difficult to assess. 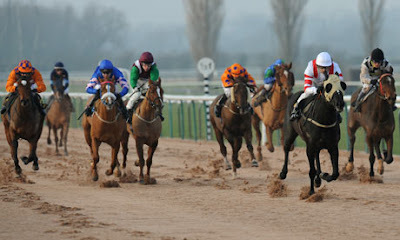 Alan McCabe is a talented trainer and if backed it would bring more confidence. It's a similar story with Tyrsal who hails from a canny stable. If betting, I would fancy Far Gaze at an each way price.